With a little bit of extra body English from her jumping coach, David Landrum, left, Souhegan’s Elise Lambert clears the bar on her third and final attempt at 5-feet in the high jump competition at the Pelham Invitational Track Meet. The Sabers’ senior took fourth place overall in the 30-team meet with the jump and came back later in the day to win the 300 meter hurdles. 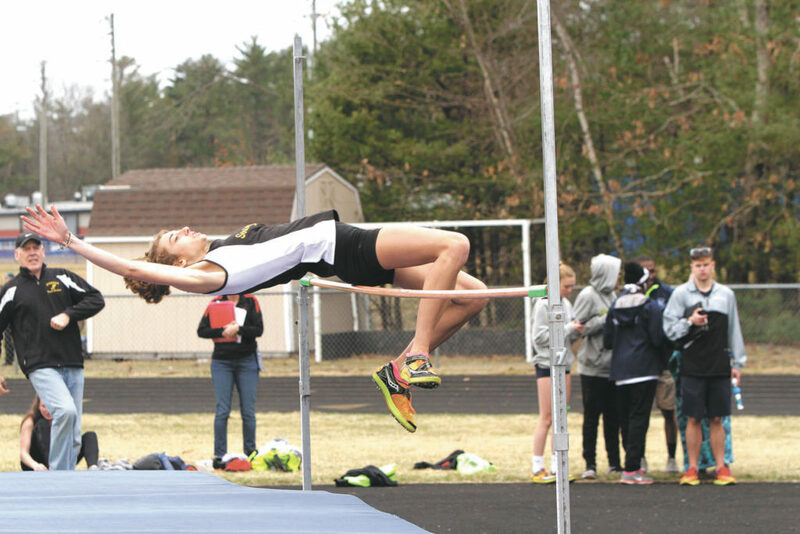 PELHAM – As early in the season as it is and as miserable as the weather has chosen to be this spring, the first major meet of the spring track season was held over the weekend. To no surprise, the defending indoor state champion girls team for Souhegan High School made an absolute statement in a rugged field of more than 30 teams. The Sabers took third place over, just 10 points off the pace of champion Nashua North, an excellent jumping-off point for the season. Speaking of “jumping,” as expected, it was senior Elise Lambert leading the way. Lambert was the lone Saber to pick up an individual victory, taking the 300 meter hurdles in 50.55 seconds. Lambert braved the cold and wind and also exhibited her penchant to be clutch, clearing 5-feet on her third and final attempt in the high jump. That effort was good enough for fourth place. Sophomore Marissa Romano got off to a fast start on her season, grabbing second place in the 800 meters with a 2:31.16 clocking. Saber Jenny Ladd was fifth in 2:35.81. Another budding distance standout, Arielle Zlotnick was third in the 3200. The junior covered the distance in 11:46.90. Steady senior Jane Leighton was third in the 1600, clocking in at 5:22.30, just ahead of sophomore teammate Mackenzie Hayden, who was fourth in 5:33.67. The other two individual Souhegan scorers came in the field events with Bailey Burke grabbing fourth in the long jump at 14-2.5, while Shannon Paquette was fifth in the shot put at 31-5. Souhegan’s 4×800 relay ream of Georgia Jones, Caroline Apike, Kayla Kilcrease and India Jones took fifth place overall at 11:12.38. The Milford girls finished 13th overall at the event, competing without distance standout Rebecca Durham and sprint sensation Viankah Williams. Each has been battling through illness. Freshman Renee Wilson was the top Spartan, claiming second in the long jump at 14-4. Classmates Olivia Vogel and Nicole Skare each cleared the qualifying height of 6-foot-6 in the pole vault to earn fifth and sixth place in the event. The Spartans took fourth in the 4×100 relay at 55.45. The state Division II champion last spring at 12-6, Milford High senior William Shepard let the state know that he’s been busy getting ready for the spring. Shepard, who cleared 13-feet this winter at the Dartmouth Relays, soared 12-6 Saturday outdoors to win the Pelham Invitational title. Shepard clicked on his first attempt at 11-6, 12-feet and 12-6. Going for broke, he couldn’t get over the bar at 13-6 after victory had already been clinched. Spartan sophomore Billy Cook grabbed third place, clearing the bar at 11-feet. Senior Michael Boucher was Milford’s other top scorer. The Spartan finished second in the shot put, heaving the ball 43-4.5. The Souhegan boys had to wait a long time for their best result, scoring a second place in the 4×400 meters, the final event of the day. The team of Christian Hall, Carter Schade, Bill Drake, and Thomas Headington ran a season best 3:56.67. Nathan Stine was Souhegan’s lone individual point scorer, with a personal best of 11:02.42 for sixth in the 3200 meters.